Once again I’m going to look back on the plans I made this time last year and see how I’ve done. 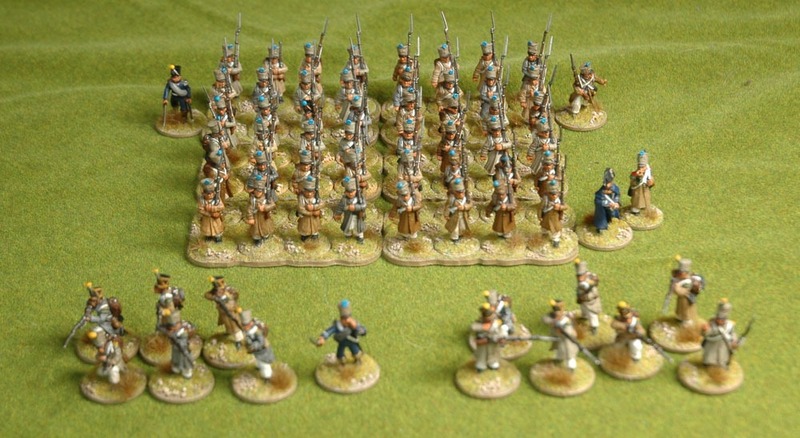 My main objective for the year was to complete British, French and Spanish forces for Sharp Practice. I’ve made progress on this with starter forces completed for the French and for Spanish Guerillas. and I’ve done some Sepoys for the Indian Mutiny as an unplanned addition. But my plans for Chain of Command (more supports and more scenery) seem to have fallen by the wayside. 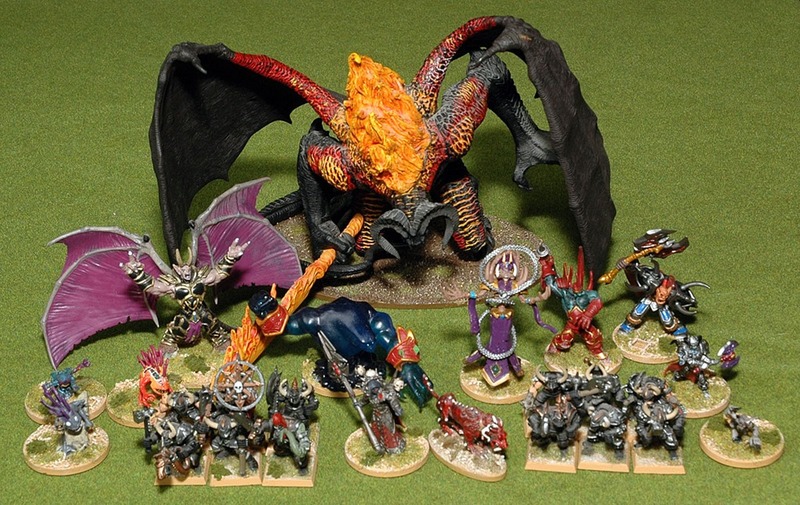 Surprise of the year would be Dragon Rampant, which really caught my attention and had me digging out all sorts of old models that have been in storage for the year. I worked together with Mike Scott of Supreme Littleness to design a range of sabots that would make it easy for people to use their old Citadel models in the game and then painted up hundreds of the things to put together Dragon Rampant forces of Skaven, Elves and Skeletons using mostly GW miniatures and a Chaos force using GW models along with pre-painted collectibles from the World of Warcraft Miniatures Game and the Lord of the Rings Combat Hex game. 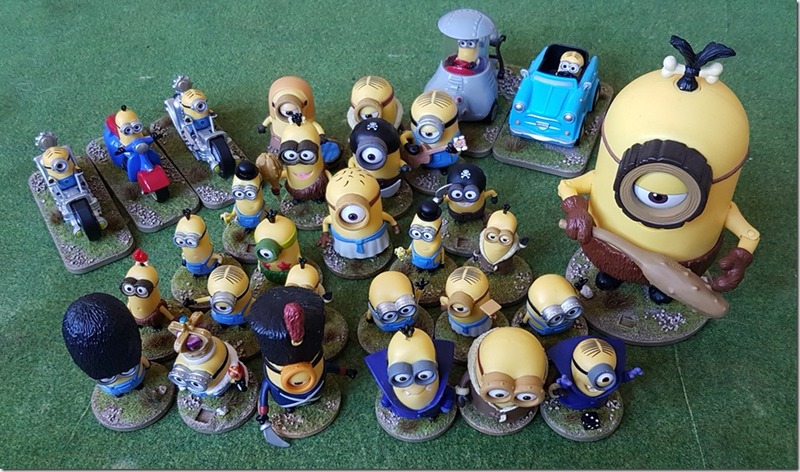 Around about Easter I can across some Minions toys in a Sale at Toys at Toys R Us and I got this Minion force for Dragon Rampant as a rather silly birthday present. I also painted a few extra figures to allow my historical armies for Dux Britannarium to be used in Dragon Rampant, that’s another two forces. It’s probably time to stop, though I’m tempted to get some Footsore Miniatures Early Saxons which would give me another Dux Britannarium force that could also be used as Barbarians in Dragon Rampant. That’s 56 games in total for the year which is not bad at all given that I only played a single game at the club in the whole of November and December (normally I play there once a week). Heavy emphasis on Sharp Practice and the Rampant games, following the focus of my painting. Notably low is Chain of Command, which seems to have slipped by the wayside, despite my declared plans to run a campaign, and also Dux Britanniarum which I’ve not played very much since my campaign partner moved to Greece in late 2015 (Hello Paul!). I ran Deep Fried Lard again and was involved with putting on participation games at the Scottish Battlefields Wargames Show (Lion Rampant) and Targe (Sharp Practice) as well as an event organised by the Department of History at Edinburgh University (Lion Rampant). Went as a visitor to Carronade, my favourite Scottish show (I don’t have to work like at Claymore) and my favourite show ever, Crisis in Antwerp (thanks to my work who sent me to Brussels the day before the show).